Increasing resistance to antibiotics has been called the most pressing global health problem of our time. Medical experts are predicting a post-antibiotic era, in which people will die of infections easily treated just a few years ago -- unless we find more of these miracle drugs. 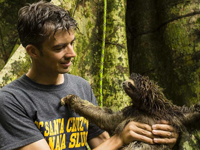 THE ANTIBIOTIC HUNTERS follows drug researchers as they investigate the slimy green fur of sloths, the saliva of Komodo dragons, the blood of alligators, and the bacteria in British Columbia caves and on the ocean floor off the coast of Panama -- all part of the urgent hunt to find the building blocks of new antibiotics. "A captivating documentary which clearly depicts, with vivid imagery and compelling personal accounts, the global crisis that is antibiotic resistance...Incredibly informative and thought provoking, I highly recommend this film." "An extraordinarily informative production...Elegantly presents the epidemiologic, clinical, and microbiologic information that is useful to understanding the nature of the microbial antibiotic-resistance dilemma." "An outstanding documentary that addresses the most pressing medical problem of our times...Riveting footage...Uses personal stories to make the challenges presented by resistant microbes immediate and memorable. This documentary is an excellent teaching tool that will fascinate as it alerts viewers to an impending crisis." "Enlightening...This video underlines an important international health problem and highlights medical researchers hunting for the 'building blocks of new antibiotics.'" "Emulating the thrill aroused by the classic text The Microbe Hunters of the 1900's, this 21st century documentary The Antibiotic Hunters animatedly recounts the current quest to detect viable antibiotics...This is a colorfully orchestrated adventure story on DVD that will appeal to a wide audience." "An outstanding film that get both the science and the human stories right. We see first-hand how hard scientists work to find new antibiotics and the devastation wrought by drug resistant bacteria. Antibiotics are valuable and hard to discover and should be used with care." "Antibiotic Hunters is a high speed, real world snapshot into the fight and fixes for one of our greatest looming health crisis - antibiotic resistance...Whether inspiring future scientists or informing policymakers and the public, this film is an important contribution to helping the nation avoid a post-antibiotic era." Man-made chemicals may be programming us to be fat - before we're even born.